Cecily McMillan was arrested on the night of March 17, 2012, which fell on both St. Patrick’s Day and the six-month anniversary of the Occupy movement—a date that would also become known for the seventy-three arrests that occurred in Zuccotti Park that night. While the police were clearing the park of the throng of protesters, McMillan’s elbow struck NYPD Officer Grantley Bovell’s face. The defense argues that this event occurred when McMillan, leaving the park as directed, was suddenly grabbed from behind by her right breast; her elbow then struck Bovell as a reflex. The prosecution claims that McMillan deliberately elbowed Bovell without provocation while he was escorting her from the park. Throughout the case, the prosecution set out to distract the jury, and Judge Ronald Zweibel gave them free rein to do so, while consistently ruling key testimony and evidence for the defense as inadmissible. 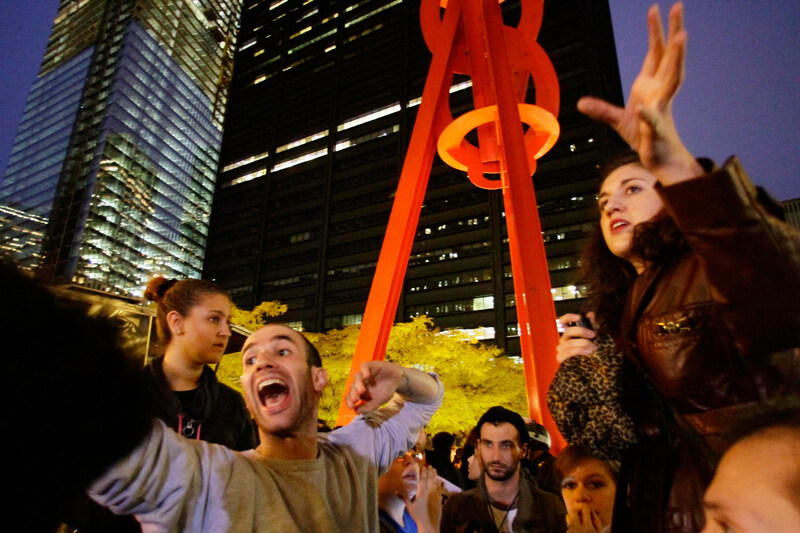 Several videos posted to YouTube show the crowd at Zuccotti Park from different angles on the night in question. However, the jury saw only a sliver of blurry footage. According to the defense, out of a ten-minute video showing the events before and after McMillan elbowed Bovell’s face, only fifty-two seconds were admitted. Another short clip was allowed without sound: this one shows McMillan convulsing on the ground after her arrest. In that audio, jurors would have heard voices in the crowd shouting at the police to help McMillan, which provides an important context to the officers’ passive observation of her quaking body. If McMillan were faking, as the prosecution alleged, it certainly fooled many of those present. Any attempt by the defense to question Bovell’s character was quickly shut down by Choi and Judge Zweibel. Although Bovell’s involvement in a Bronx ticket-fixing scandal was discussed, the defense was prevented from addressing other, violent parts of his record. In 2010, Bovell was involved in a lawsuit against the NYPD for his participation in an incident in which NYPD officers ran a teenage boy on a dirt bike off the road. In 2009, he kicked a suspect in the face as he was lying on the ground. Bovell also allegedly assaulted Occupy protester Austin Guest on the same day as McMillan’s arrest. In her closing argument, Choi asserted that McMillan’s story would be more believable if she claimed that “aliens came down that night and assaulted her.” So let us consider: according to the prosecution, it’s more believable that an activist whose reputation is founded on nonviolence would decide to change her St. Patrick’s Day plans with friends in order to pick a fight with the police just to gain some attention (including elbowing one in the face once the cameras were rolling). Then, after her arrest, she instantly decides to fake a harrowing seizure and, at some point after her admission to the hospital, severely bruises her own breast for the purpose of framing an innocent policeman. And this is the story that the prosecution (and, unfortunately, the jury) found more believable than the possibility that, on a night when protesters were being arrested in a manner that The New York Times described as “brutal and random,” an officer who once kicked a suspect in the face grabbed McMillan’s breast in a manner consistent with the pictures of her bruises entered into evidence, causing her to flail out with her elbow in a startled reaction. Or that an NYPD officer who was on probation at the time for his involvement in a ticket-fixing scandal would need a justification for the bruises on his prisoner and his public indifference to her medical distress? Ultimately, to Judge Zweibel and his court, it was more believable that this young woman is simply crazy than that this policeman could commit an act of sexual violence and then lie about it in a manner consistent with his personal history and the culture of the institution that employs him. It’s not even a good story, but it had a hell of an editor. In a just system, editors don’t belong in courtrooms—and Cecily McMillan doesn’t belong in prison. Kathryn FunkhouserTwitterKathryn Funkhouser is a writer whose work has appeared in The Atlantic, The Toast, The Hairpin and The Billfold. Her play, We're Not So Different, You and I, will be performed as part of the Radioactive Festival in New York City later this month. Visit her website at kathryn-funkhouser.squarespace.com. Follow her on Twitter @KatFunkhouser.